The main reason it is worded like that is to allow for reuses of the power with variable numbers of Stealth Markers. Like a higher point figure might get 'Stealth Suit 3' or something that lets them sneak around a bit better. I figured this was the case. I like the idea and think the concept could be expanded in neat ways. Agent Fawcett has received 5 Yea votes to review (Scytale, vegietarian18, superfrog, wriggz, and Ixe) and moved forward in the process. Last edited by Scytale; February 13th, 2017 at 02:54 PM. Viceron the Blood Knight has pass United Fanscape Review and moves forward in the process. Maltis Tez by @Leaf It did not pass United Fanscape Review and is removed from the process. The point of contention is the unit's very low cost. Beyond simply balance concerns, 25 points is inappropriate for a unit with this utility and survivability. Maltis Tez by Leaf It did not pass United Fanscape Review and is removed from the process. The point of contention is the unit's very low cost. Beyond simply balance concerns, 25 points is inappropriate for a unit with this utility and survivability.
. . . and please use something other than guesswork to arrive at a price. Each of us who votes on a unit has taken time - some a little time; some more - to consider the nominated custom and then to discuss it. Please do not guess, and this goes for all of you, an appropriate price for your design. Do your best to get it right, using playtesting experience and/or careful expert analysis, whether your own or that of others. Every nominee gets careful consideration, which means every time there's independent analysis by each (or many) of us, followed by discussion. That's our time, given freely, but please do not take it for granted. Sorry to be prickly, but there it is. Sometimes I'm prickly. I'm not a judge and I'm not speaking for these guys on the SoV, but I do participate in the Round 2 voting, and to that extent you may find value in my perspective. Evil Knights are cool. Ever since Hawthorne, I think the game has been implicitly asking for more of them. While we now have Phantom Knights and Death Knights and Knights of Blackgaard, we haven’t gotten another evil Knight Hero. So how well does Viceron (a Dark Knight) fill that void? For anybody who is confused as to the main difference between balance and playability, playability makes sure that a unit is engaging to play and powerful enough for its point cost. Balance ensures that a unit doesn’t do the same job as another unit for a cheaper cost, or is strictly better than another unit for the same or similar cost. New units shouldn’t stop old ones from being used. So Viceron is hard to evaluate on Balance. He does something that really nobody else does. He has a decent attack and defense, an area of effect special attack, a power that wounds him, and a power that heals him. That’s a unique combination. For a very rough approximation, we can compare him to Eltahale. Viceron has an extra defense, can target more people with his special attack, and has the possibility to heal himself, but gives up 2 life and 10 points. Seems about even. A magic bloody Dark Knight seems pretty cool to me, at least after you get over the fact that he’s not Batman. I love the name Bloodstorm Ritual, and it perfectly translates to the mechanics of the power. Sanguine Sword also works for me, although I’m not sure exactly on the theme as to why he can’t heal from Special Attacks. It doesn’t bother me too much, though. Bloodstorm Ritual is a fun new power, which borrows ideas from Heat Blast Special Attack and also from figures like Eltahale or the Azurite Warlord which wound themselves for benefit. I also think the interplay between Sanguine Sword and Bloodstorm Ritual is smart. It provides a way for him to heal, but it forces him to switch between attacking normally or with his special. Viceron starts out with the weakness of being a non-synergizing Unique Hero. To make up for that, he has a high attack (to help kill heroes or to “ensure” a kill on squad figures if he needs to heal), and a multi-attacking special attack (to deal with massed squaddies). It theoretically should work relatively well. He uses Bloodstorm Ritual when there are a few squad figures around, and then follows up with a normal attack to get his life point back. 5 defense ought to be enough to fend off most attacks to allow for at least a few Bloodstorms a game. But I found it rarely worked that way. 4 life is fairly low for such an expensive figure, and much lower than any other figure with a self wounding ability (6 on Eltahale, 8 on Azurite Warlord). Although Viceron also has a higher defense of 5 (compared to 4 on Eltahale and 3 on the Azurite Warlord), it still leaves him more vulnerable. He needs Bloodstorms to keep the number of opponent’s attack down, because 3 attacks of 3 still reliably wounds him at least once, and he needs normal attacks to gain his life back. If either one fails, he’s quickly overcome. The problem with Viceron is that his two powers aren’t enough to keep him competitive. Swarms squads like Vipers or Red Ants don’t mind losing 2 or 3 figures, because they can just keep coming, especially if he takes a break to try to heal himself. More expensive melee squads like Heavy Gruts or Axegrinders also have more attack output, and are more likely to survive his Bloodstorm blasts. Ranged Squads just need to spread out and avoid clumping, and that negates the threat of Bloodstorm Rituals. Unlike Brimstone, Viceron has no backup bonding squad, and much less maneuverability. The inability to fly behind enemy lines is a big negative. Long story short, Viceron just isn’t as effective as he needs to be. He needs to roll well on every turn to prevent enemy squads from running over him. His opponents only need a few good rolls to take him down, and he needs good rolls every time to keep his head above water. I never had Viceron earn his points back in a game. I really wanted to like Viceron, but in the end, he just wasn’t powerful enough to justify 150 points. This was my review of the original version of Viceron. There are two changes to the card to this new version: He's a Blood Knight instead of a Dark Knight, and he's 20 points cheaper. As I said in my first review, I liked Viceron, he was just too expensive. 130 fits him a lot better. And as a Blood Knight, he can no longer be mistaken for Batman, so that's a good thing, I guess. I vote to induct Viceron the Blood Knight into the Soldiers of Valhalla. Shouldn't Agent Fawcett have blonde hair? After attacking an opponent's figure with Maltis Tez, you may move Maltis Tez up to 1 space. This space may be up to 5 levels higher, or lower. Maltis Tez never takes leaving engagement attacks while using Combat Positioning. 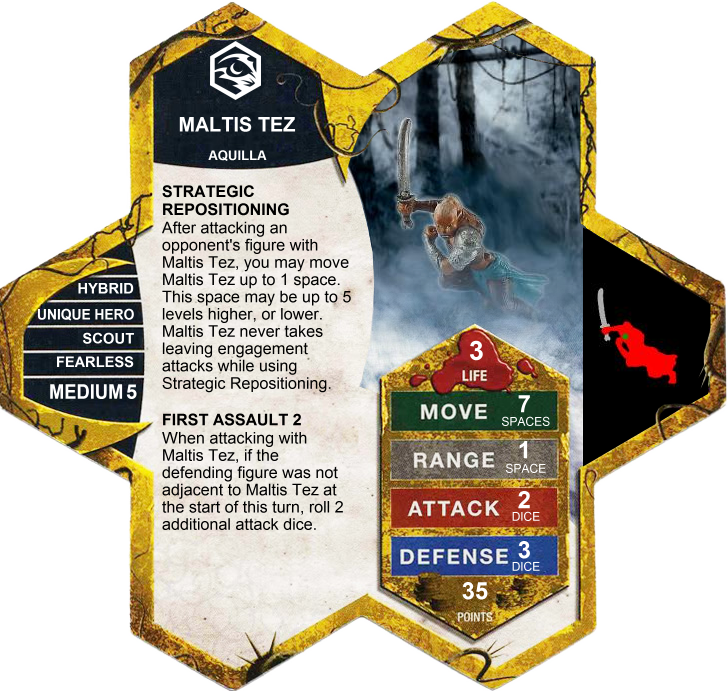 When attacking with Maltis Tez, if the defending figure was not adjacent to Maltis Tez at the start of this turn, roll 2 additional attack dice. Known synergy with: Teeth of the Makwa, Venac Worlord, Brave Arrow, Van Nessing, Seleena, Werewolf Lord. The figure used is Angelfire #22 Longstrider Ranger, or Angelfire Longstrider Ranger (Promo # DDC24). Both figures are the same sculpt. "Why is she 35 points now?" I compared her to other figures of the same price range (25 - 40) and found her to be of comparable utility, and usefulness to other 35 point figures such as 8th Infantry Pathfinder, Command Courier, Hoplitron, and Seleena. The Sahuagin Raider, Drow Chain Fighter, and Kira Jax are indeed at a lower utility point, (though I love the Drow Chain fighter, and would argue with anyone that they are amazingly useful) However I believe Theracus and Sonya Esenwein to be of a higher utility/impactfullness level. So with that in mind, and some testing done, I arrive at 35 points. "Why was she 25 points before?" I didn't study the price of other units when I had priced her at 25 points, but instead went off of the comments given that 50 was too high. In combination with a number of tests where I priced her at 25, 30, and 35 points, when she didn't seem to be more impactful than Isamu,(I know he's considered OP, but would you really put him higher than 25 points?) I believed the points were roughly where they should be, but I decided on 25 instead of 30 or 35 because of the calls for the price being too high with the previous submission. It was not a flat out guess, but I should have done more to get the price right. If 35 is still too low, then I think I'm done here, as I apparently lack the ability to price figures. I wouldn't get discouraged. Creating a worthy mini that passes SOV is hard work. I think I have submitted 5-6 different designs and have failed to get one unit passed yet. That isn't to say anything is wrong with my customs. Not all customs, in the end, are SOV worthy. I would encourage a longer playtesting period, 2-3 months, and tweaking a value here or there to find that Goldilocks zone. Personally, just changing the point value at this point feels too premature. If I were you, I would remove it from the process, and really test it for a while till you feel very comfortable with the mini. Running tests with similar units in the same army to see how Mal compares. From one aspiring designer to another. This is a tough sell to me. I'm not sure how a designer should proceed. Leaf It says he ran a number of playtests at 25, 30, and 35 points and based on the evaluation of his tests came to the 25 point conclusion. He was told that was incorrect. I don't think doing more testing from his perspective would be useful. Asking others for advice would be the only next step I can think of. Now if 'a number of playtests' is actually a low number, then clearly more testing could be done. But if it truly is a definitive amount of testing for the designer to draw a conclusion on point total on, then additional testing seems superfluous. That last bit is the point. There's not a huge amount in Leaf_It's posts that indicated he was sure of 25pts last time and not much more to indicate that he's confident of 35pts now. Maybe it's just how it's expressed, but a substantiated argument for a point total the designer believes in is what seems to be missing (certainly last time, maybe this time). Asking for others to help him playtest, and come up with their conclusions? There is no book that says run X amount of tests, and you will have your answer. Yeah, I'm a bit torn too. Part of the concern is that not enough time was put into polishing this unit (we have a guideline about not just "slapping together" a unit to nominate). That said, we thought the design of the unit was solid, just that it was costed wrong. Obviously if 25 is too low and 50 is too high, 35 is a logical point. And costing by comparison is an essential part of costing, to make sure it's balanced. That said, I am glad to see you say you did tests before both rounds of submission. I vote to accept for review. I think 35 is a good price point. I hope that the quick turnaround doesn't put off voters.